Click on the army (left mouse button down and then up again), then you set the path by moving the mouse and finally double click when you are done. You can change this behavior in account settings (Move armies by clicking). If you are using a touch screen you should use the mobile version. The army will move one dot per day, so click on the bonus turn button to make the time run. Each turn/update happens at the hour change or when you use a bonus turn (mentioned in the game as days). Even if you are not online, the time will run and stuff will happen in the game. If you have ordered new buildings to be built or trained troops, your peasants will build and train even if you are offline. This might seem slow, but this is not the type of game you finish in an evening. One era/round take over a month! To do well in the game you should login at least once a day to give new orders to your people and make sure your cities aren't taken over by enemies. To make the time speed up a bit there's bonus turns. You get bonus turns by helping the game. Check out the help vu link for more info. Before you can build any buildings, you need to start up an colony. Go to the army "transfer" page and hit "settle colony here". There are ten types of buildings in the game. The main buildings are homes, farms, mines and lumber mills. It's recommended to only build those in the start. They will produce the major resources in the game, gold, stone and tree. Homes will make peasants move into the city. Each working peasants pays tax. You should continue to build these buildings until you have an income of around 8,000-10,000 gold a day. Then you have enough income to make an army. Go to the army "transfer" page and hit "Create a new army"... But you also need troops to put into the army. So go to the train page and train some of the cheapest troops. The more-expansive troops are better, but also cost a lot more. However, you can build armories to make them cheaper. To place the troops in the army, you have to select the army on the army page and click on the arrows. To attack a city, move your army close to it. Once the army reaches the city you click on the "city name" to get up the city info screen. If the army is close enough there will be a link that say something like "Lifeguards army awaits your commands, mr". Click on that link to bring up the "army command center". There you will see the attack options. Take a look on the odds and if they are good, hit the "Take over the city" button. Most likely your army needs to prepare a few days to be able to attack with full streangth. They will prepare automatically, so just wait or use your bonus turns to let them prepare. It's adviced that you start making friends and allies or it will not take long until you are dead. You should message the rulers around you and ask for NAPs. If they have a open spot in their group/kingdom you should ask if you can join and if they don't belong to any kingdom/group you should create one with them! You will need to click the Character Icon, shown below. The Icon is highlighted yellow. Click it to pull up a new menu to create a Character. When selecting option to "Join a kingdom that accepts new players"; there is a chance you will land instead an inactive kingdom, or already dead kingdom. It also randomly selects one, you have a chance to land on higher up worlds with veterans and skilled players. It is best to select "Do not join a kingdom right now". Doing this means you will not have a kingdom. Selecting "Spawn on the map" will place an army on the map for you. This will make you "alive" in terms of game play. Most of the time you will be directed to a screen looking like this. Here you simple choose a name, race, and the world you wish to play on. You can see how long worlds have been going and the level there by click the Worlds Icon. It looks like this: and is located in the side menu bar. Click restart. You will see a menu similar to this one, and you have now successfully created a new character! Now you may begin playing. Once you have spawned on the map, you will start with 50 level 1 troops and 1,000 peasants in the army. On the side menu you will see your army name. It will look like this. Click NEW CITY. Here you will name your city. It costs 50,000 for the first city. The price progresses as you own more cities. You will now see something like this on your map. The next step is to transfer the peasants and some of the troops into your city. Beside the option where you clicked NEW CITY. It will say TRANSFER. It will pull up a menu looking like this. Here you can see what troops are in your army. Also you can see peasants, free beds, and the percent of your homes that are full. This way you do not put more than your homes can hold. Clicking will move troops/peasants into the army. Clicking move them inside your city in homes. Each home houses 25 people. Transfer 49 farmers and all the peasants into the city. The next step is building. Here you can see what comes standard in your first city. At the bottom shows the buildings you have built and how long they take. Every city built after this (unless you have no cities) will only contain 1 guard tower. You will want to click Show all! so you can see all the buildings. A good option is to build 302 mines (if halfling, each race is different for the amount you can build). It shows you at the top how many buildings your city can hold and how many you can currently build. We cannot build more buildings in this city at this time. Wait until some of the buildings in construction have finished. We will build 302 Mines for 12080 gold, 906 tree and 604 stone. Now you must wait for another turn. Each turn happens every hour. It is known as a tick. 1 hour in real life = 1 day in game. You can use these now to make time go by for only you. Or save them for later in game. Being new I recommend using them now until you learn the game better. Before using them, it may be best to move your army. If you left click your army, you may begin moving it. Once you clicked it, you move your mouse and it will create a path for the army. Once in the desired location, double click and the army will stop there. You can change the way the army moves in your settings. Each of the biggest X's are 1 turn. Move the army so it is a few turns away from your first city. Now its best to use 1 turn. Once you have done that, open up the build menu again. It will tell you an amount you can build. Sometimes its best to build all homes this turn. Once you have done that. Use another turn. You may now build more in that city. A good option is to build all mines. If you moved your army 2 turns away. You can now settle a new city. In the new city you will be able to make 102 buildings at the start. it will always be this way. Its best to build homes first. Now use the 3rd and last turn. You may build in the cities. 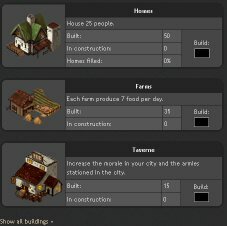 You will want there to be 1 home for every 5 production buildings. So a 1:5 build ratio once the city is maxed. After 5-6 turns of buildings, it will be best to build some lumber mills and farms. Your food will start to go down, and you will run out of lumber if you do not. It is common to "rainbow" the first city and build some of everything in it. Once you learn more, you will notice people build one city for each resource. You get better production this way. You also get a bonus from mountains if your city with mines are close to them. Same for lumber to forests, and farms to water. A 90,000 city will have the bonus once its maxed. The max city for a city is 90,000 if placed correctly unless your human. The max city size for human race is 200,000 buildings. The is the basics to building your first city.